It took years of facing skepticism and relentless experimentation, but Insider Inc. CEO Henry Blodget ultimately took the prospect of digital media and turned it into a multimillion-dollar company. 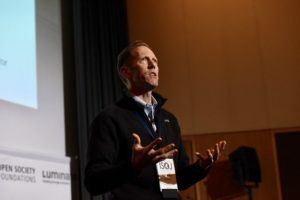 Blodget discussed how he finds success and faces problems in a keynote speech on April 12 at the 20th annual International Symposium on Online Journalism (ISOJ) in Austin, Texas. When Insider initially launched in 2007 with three people “frantically” typing in a loading dock, Blodget said the idea was to build as large of an audience as possible before their money ran out. Blodget laughed through his reminiscence of attempts at video and audience engagement. Throughout the early years of the company, he clung to the idea digital media would evolve the same way print and broadcast media had. Ultimately, he said they assessed and realized some of the work they were doing mirrored the linear video audiences were already offered by broadcast media. Now the company boasts podcasts, Insider TV, a variety of sections, millions of social media followers, an on-site audience of about 170 million and a global reach. Blodget pointed out the audience Insider caters to lies between the ages of 15 and 40. He repeatedly brought up how his young daughters respond to Insider content, inspiring him to reach beyond solely business-related material. He conceded there are two issues the digital industry and journalism in general face. One is the competition between publications in acquiring audience attention. People spend six hours a day consuming media and there is a fight to capture those hours, according to Blodget. The second issue is the preservation of local news in the digital age. Dallas Morning News editor Mike Wilson, who interviewed Blodget on stage, lightheartedly expressed his displeasure Blodget’s slideshow presentation ended with a call to fix local news but provided no further instruction. Blodget said he thinks it will be a combination of advertising and subscribers, but a model of 100% subscriptions to pay for media won’t work. Blodget emphatically compared the demand for subscribers to pay for news, to his own consumption of basic goods. Blodget countered shows and feature stories for entertainment balance out the hard news consumption, as well as help pay the bills. This commercial section is what advertisers are looking at and want to place their name by, according to Blodget.